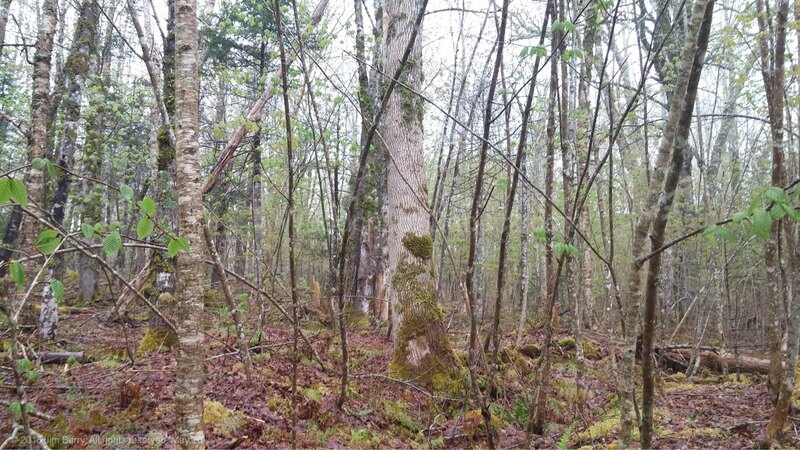 It didn’t take too long to connect with a land owner who has beautiful wooded acerage. 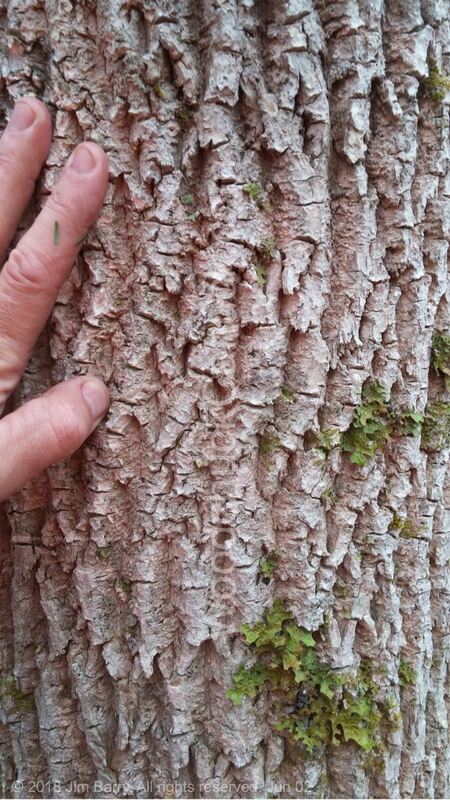 So he and I took a drive, looking for suitable size trees. 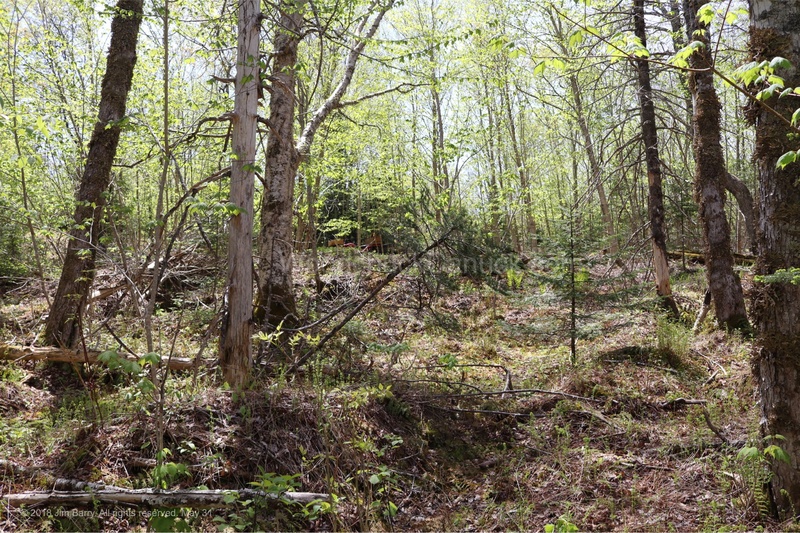 A healthy mixed species forest. 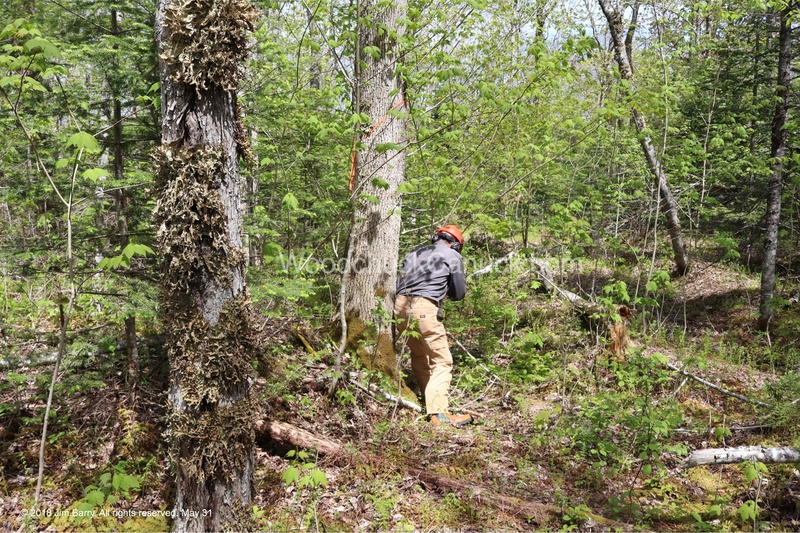 A short email back and forth with the Dept of Natural Resources to make sure the trees we found were not Black Ash trees. 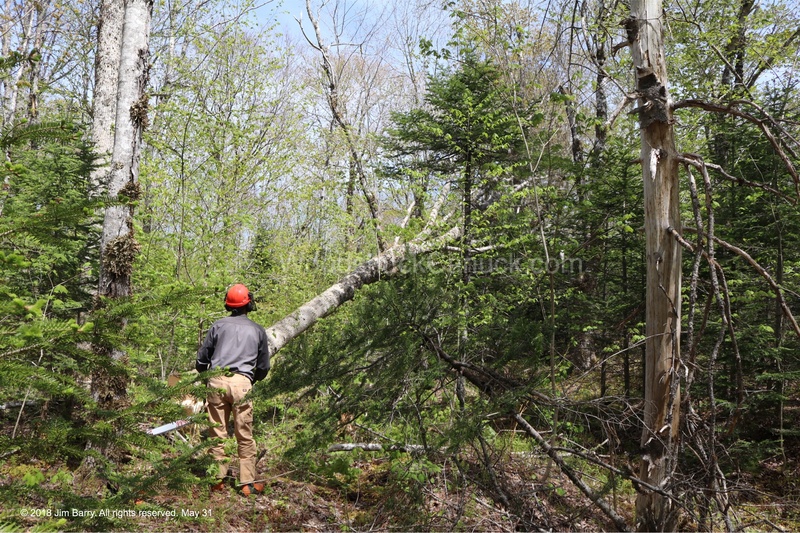 Did you know that Black Ash trees in Nova Scotia are protected? 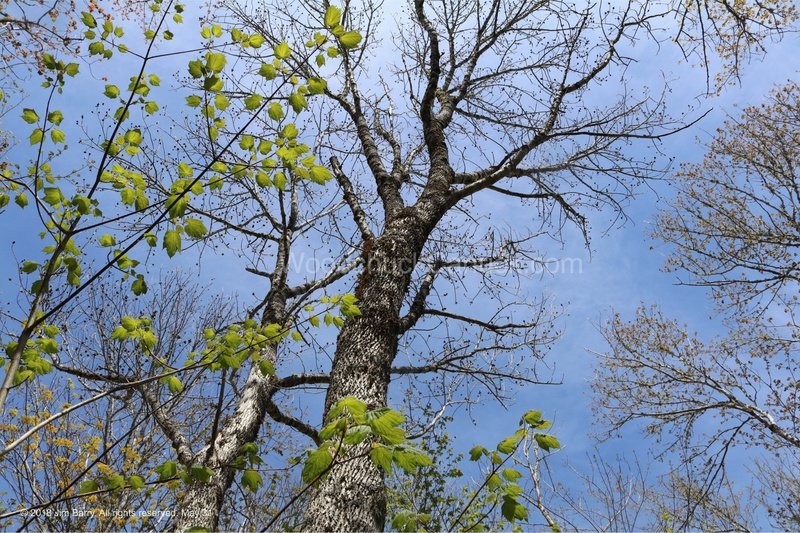 Black Ash trees are also know as Wisqoq. Once we identified a couple of trees, it was a matter of waiting for decent weather as the road going into the location is still quite soft. Eventually it warmed up and we headed in. Just left of centre in the picture below is the road where we parked the quad. You can just barely see it. That means we have to pull the logs uphill to the road. Time to get busy as the day was warming up. It was about 25ºC at this point in the early afternoon. I don’t suspect we will be here for long. 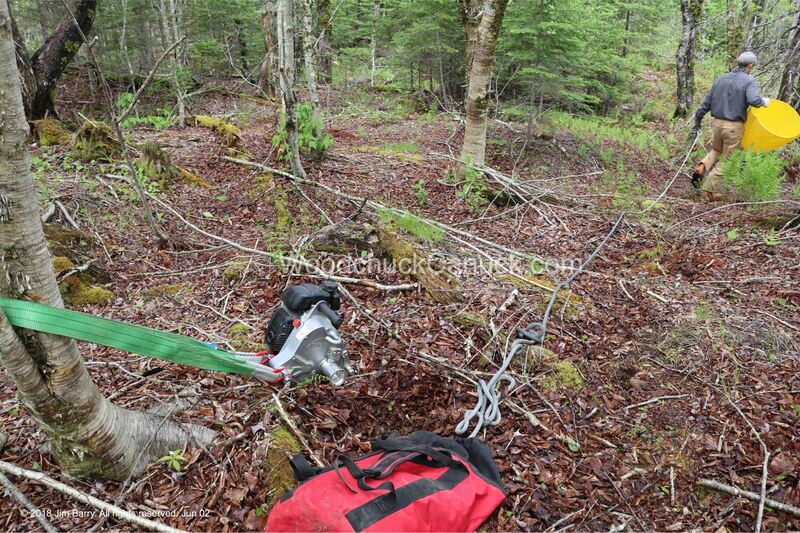 The ash tree you see below was one we had marked with orange tape on the day we did our scouting. Down it comes. This picture is as the tree was falling. Not exactly where I wanted it but the crown came to the ground so it should be fairly easy to limb it up. 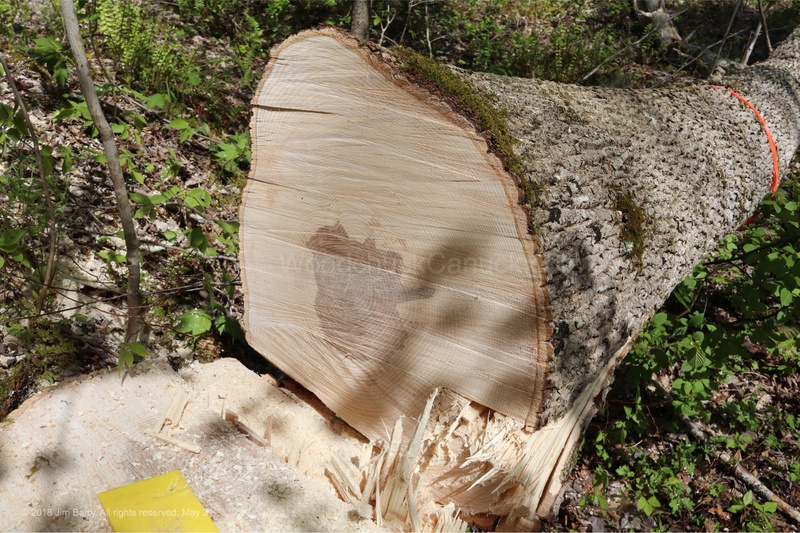 The first white ash tree measured 13 inches at the 6ft mark. The first two lengths were nice and clean and more importantly, straight. 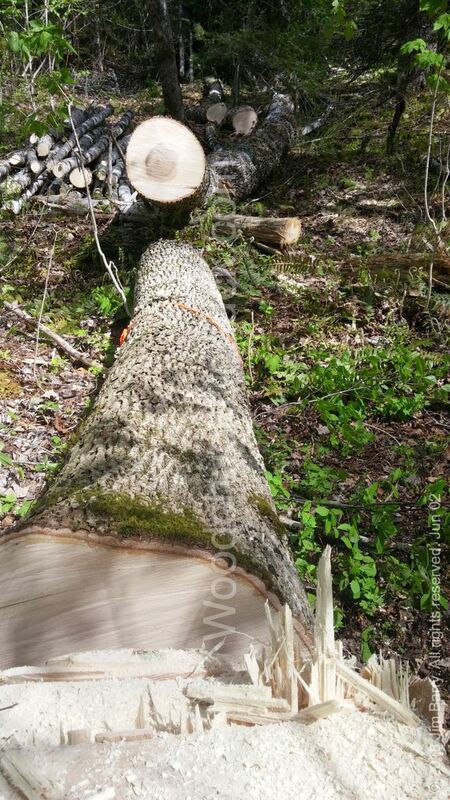 White ash tree bucked into 8ft lengths. We were making our way up to the crown, limbing as we went. The afternoon was getting hotter and hotter. Before we quit for the day, we knocked down about 90% of the crown. All chopped up into one foot pieces for quicker recycling back to mother earth. The fact that the chain came off the saw and got jammed was the lead contributor to calling it a day. That and the blackflies. Making our way up the crown. The start of another day brought cooler weather and a mixed bag of sun, wind, rain and the occasional snow pellet. Its June for crying out loud! Someone needs to reminds Mother Nature. We traded in our bug repellant for warmer jackets. 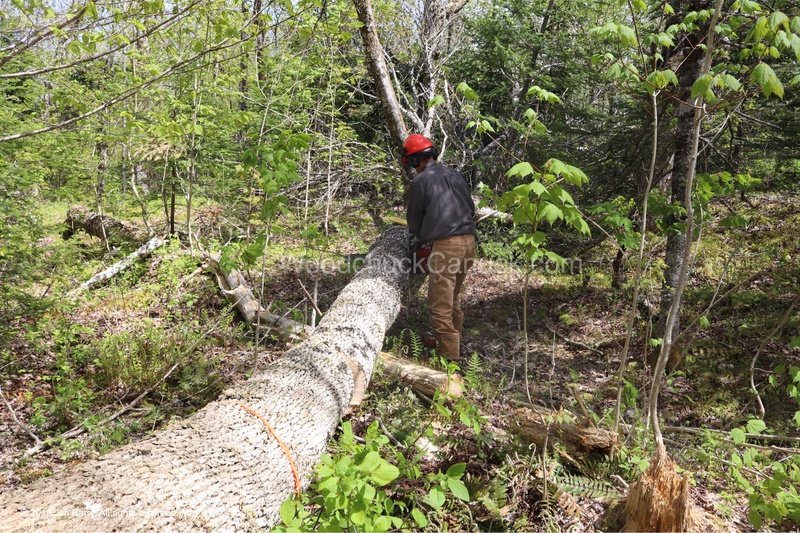 I head down to chain up a log while Gina stayed up to operate the winch. Heading out for another pull of logs. I didn’t think the stump log was going to fit in the cone but it did. 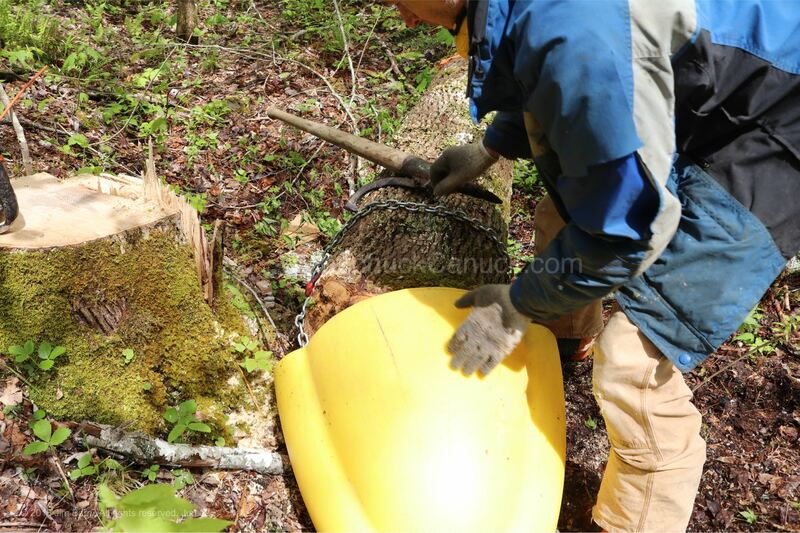 The cone is handy to help the log navigate on the ground around bumps and stumps, rocks and trees, without getting hooked up, and without dragging the front end of the log through the ground. Jim sets up for a pull of the stump log. It took about a minute to pull the log up about the 100 ft or so from the embankment to the road. The only work really is guiding the rope through the winch capstan (part that turns) with a slight pull to keep the rope tight. Other than that, its just to keep in communication with each other while the log is travelling, since Gina can only see it once it gets up the hill a ways. Gina shutting down the winch after pulling a log. So in less than an hour we pulled up the first tree, along with the crown limbs down to about the 3 inch diameter. 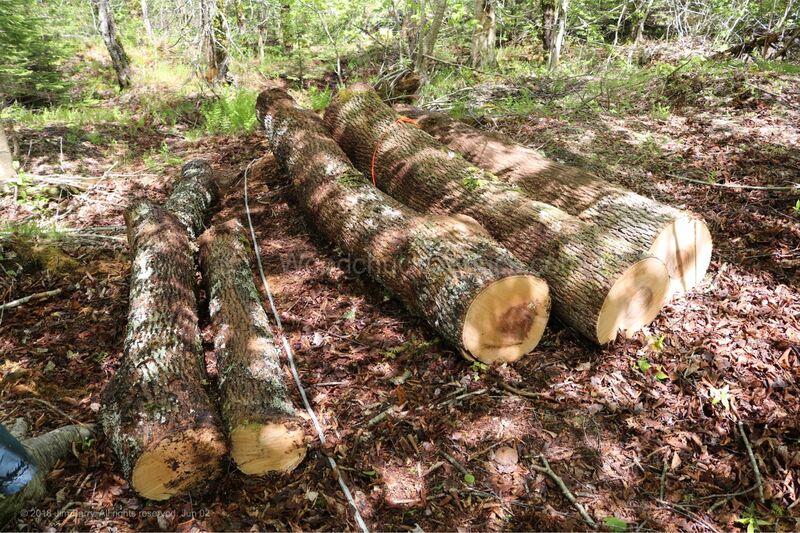 We will use that for firewood. 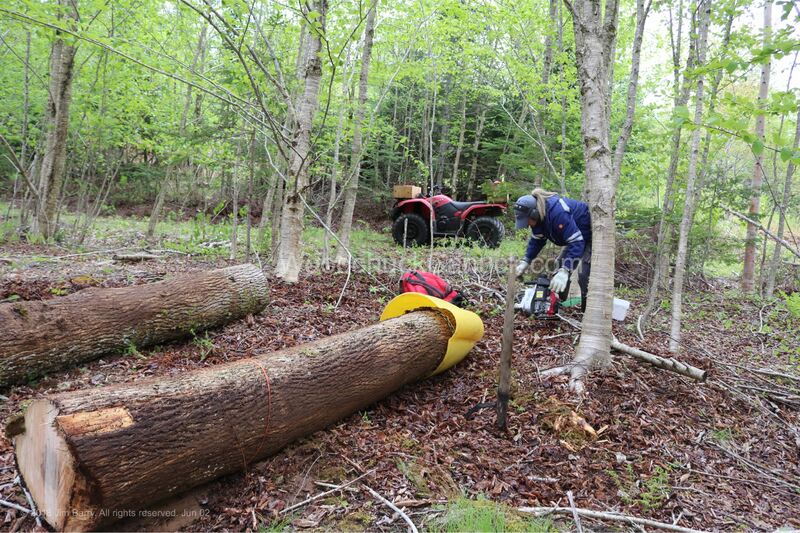 Below is a little video of us winching logs up from the hollow. So that takes care of getting it to the road. Getting it home is another story, which will involve the skidsteer and a trailer.